After several months working fine, the datalogger v1.0, described in the project has been a success, without any relevant incident, but it has always required to have a computer started. It has been power outages and the computer has restarted without problems but not the serial port attached to the Arduino, and some sensor samples have been lost during these periods. So I decided to design a more robust datalogger, following some ideas already present in jardiNet. Just two comments on this: Arduino Uno has only 32KB of memory and the Mega 256KB, so to implement all features in Arduino Uno it is necessary a very good developer, as my code needs actually about 36KB. I'm not such developer. The other point is that Arduino Uno has only one serial port and the Mega has 4 ports and this has been definitive in order to get a more versatile system: I power the Arduino using the USB connector associated with serial port 0 and I use serial port 3 to connect with the computer. Note also that serial port 0 is also used by the XBee. So I need to find some shield with SD and XBee support. 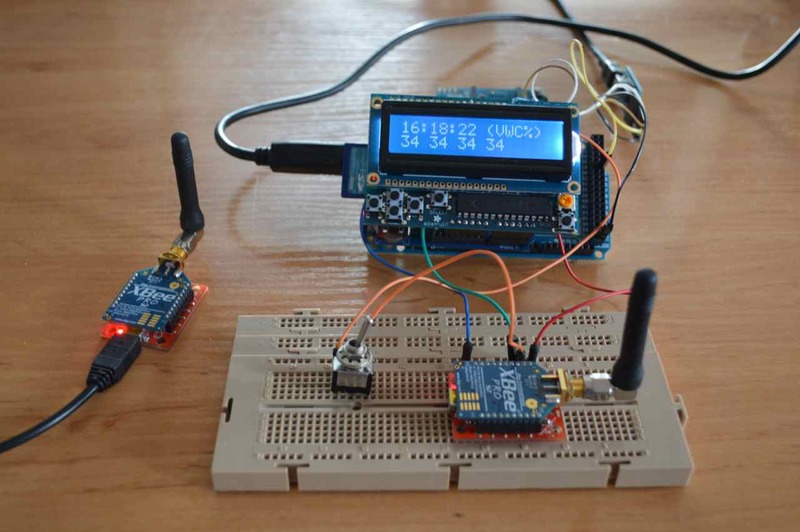 I've tested two shields: 'Arduino Wireless SD Shield' i 'Adafruit Assembled Data Logging shield for Arduino'. So finally I used the shield from Adafruit because it has the Arduino pinout 1.0, so it has additional SCL and SDA pins next to AREF pin, which are needed by the LCD shield. But there are also advantages using the Arduino shield: it is possible to use an updated version of the sdfat library, instead of using the standard SD library that comes with the Arduino IDE. And this is not a trivial question as the standard SD library does not support usual functions like a file rename, so I've needed to code my own function to rename files in the hard way (create a copy with the new name and delete the original one). 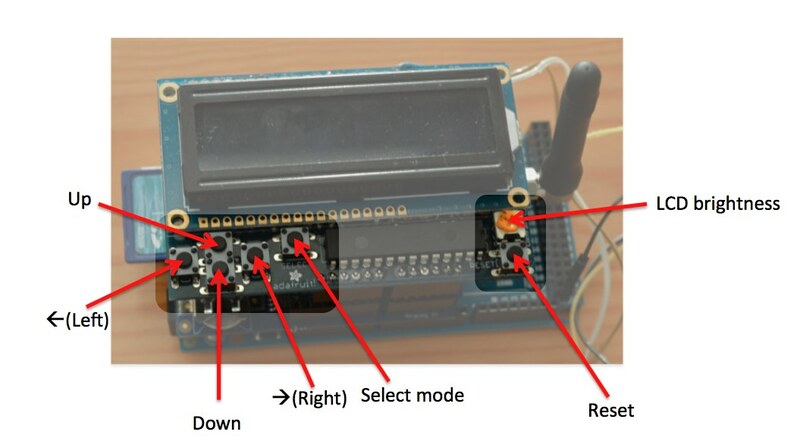 Also the Arduino shield has a switch that simplifies a lot the development as it removes the need to physically unplug the XBee to upload Arduino code, but this can be addressed just adding a switch and few wires to connect the XBee to the Arduino, as shown in next pictures. Add a Real Time Clock. I've replaced the Objective-C code in arduinoToSQLite by a python script. I've replaced about 1500 Objective-C lines (sample code used), plus other resources like the user interface design objects, by a 150 python lines. Python is really powerful for data extraction and processing. I've also need to say that I've lost a very easy to use user interface, replaced by a simple configuration file, but it work!! For sure is not really needed at all as it doesn't implement anything critical, but it helps a lot to know the datalogger status, adjust time or just see the last sample read from sensor. I've choosen this one: Adafruit RGB LCD Shield 16x2. But I've changed a little the assembly process, following this post in Adafruit forum, in order to manage the keyboard interrupts in the Arduino. It is only necessary to add a wire (soldered) in the LCD display (MCP23017 pin 20) and modify the Adafruit libraries provided, as explained in documentation. I said it before: the Arduino Mega has four serial ports and I need two of them. 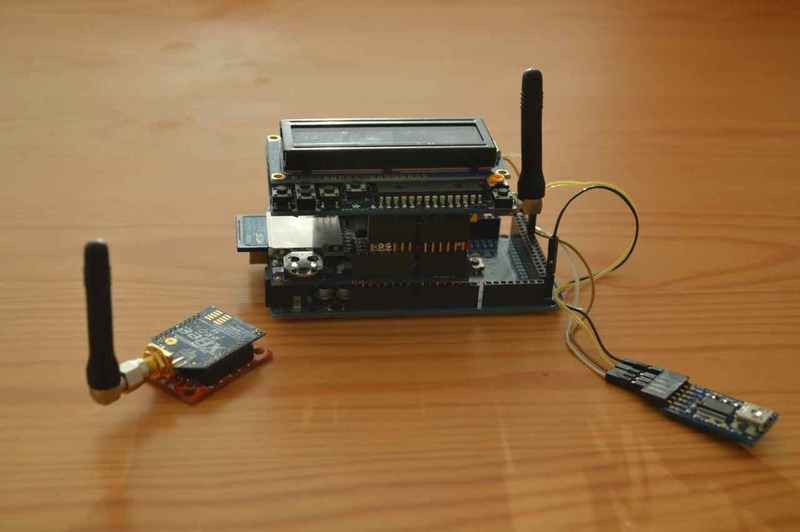 Arduino has only one, but when XBee receives data and send it to Arduino, the serial port 0 is still connected to the USB-to-serial converter, so it is possible to send data to the computer at same time it's received from sensor. Unfortunately the Arduino cannot be uploaded with new code with this setup. So I use serial port 0 for Arduino-XBee communications and to power the beast and I've added an USB-to-serial shield to serial port 3, Adafruit FTDI friend, to mantain computer connectivity. Even when the basic functionallity of the datalogger is already described in jardiNet v1.0 I will briefly describe it again. Date flow is a little bit different than in version 1.0. Now, the datalogger converts the readed values in XBee analogic inputs to millivolts, in this way is transparent in the data flow (before I converted data before to be saved in db). 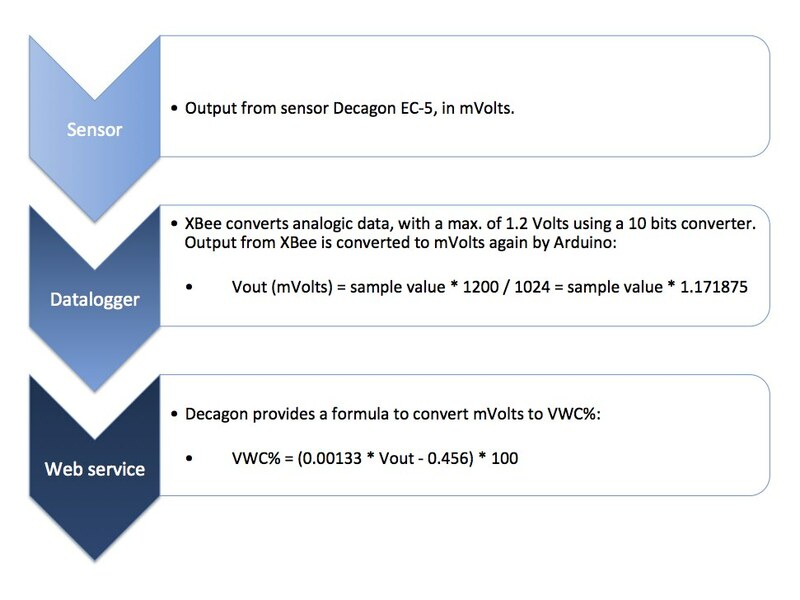 So in db we just save the values in mVolts provided by sensor and it's the web service coded in python, finally, who reads the database and applies the formula to convert this value in mVolts to VWC%, so the final value is obtained at query time. I prefer to have the latest calculation in the web page and mantain in db values in mVolts, because now I'm using the standard formula provided by sensor manufacturer but it is recommeded to calibrate the sensor to have a better precision. If I do it I just have to change the web service code, without any kind of conversion. Arduino code has also changed a lot but not the portion of code that manages the XBee. Code is now complex as the Arduino has to manage interruptions to respond to the keyboard in display. The Arduino does not have a multi-threaded architecture to solve this issue in a clever way, so code is not easy to understand, but it works. !! 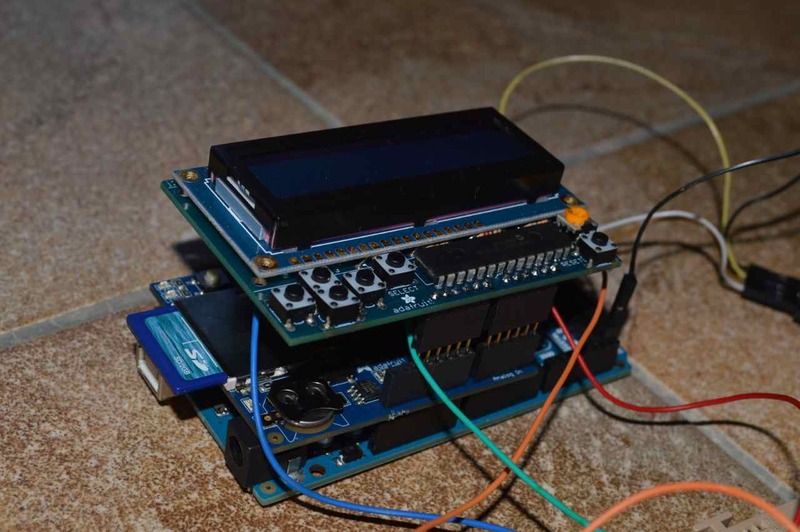 handshake() function is executed inside loop() and it manages the connection with the computer, in this way the Arduino knows if the data must be sent to db or it is only to be saved in SD card. We have to establish a compromise between the frequency of handshake() runs and the time that loop() uses to receive XBee packets. If we execute the handshake() too frequently there is the risk to loose sensor data packets. 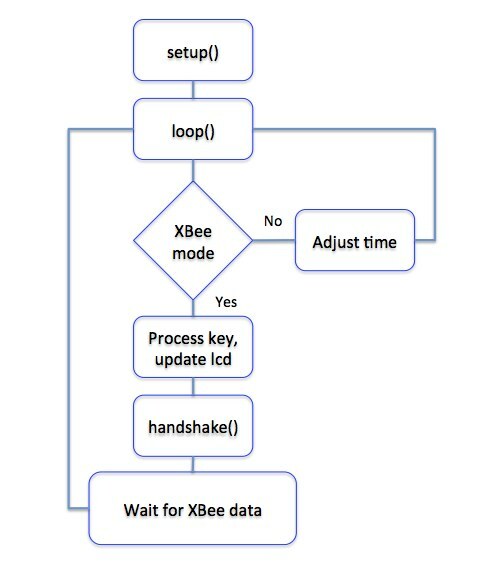 In the actual version, handshake() runs every 5 minutes and most of the loop cycles are used to run function xbee.readPacket(XBEE_TIMEOUT) which allows to read the sensor data and process it. Finally just to comment that the web service code, already in python has not changed. Attached is the code in use: jardiNet_v2.0.zip. You can freely use it but if you improve it, please, explain it to me to see if I can also improve it. XBee mode: Arduino is waiting for sensor data via XBee and it stores it in SD card, and it's sent to the computer if it's connected. If it's not connected sensor data will be just stored in SD but immediately sent to the computer when active. It is the default mode and the keys Down, Left, Right show system info. Select mode: provides basic functions to adjust time, but be careful as when in this mode sensor data received will be ignored. Set date & time allows to adjust time in the Arduino, and defaults to the timestamp of last code upload. Save time stores time in the Arduino, and it requires to confirm the action using Left button (<--), in the same way that is required to return to XBee mode. 1.0 version is now history and in 2.0 only the datalogger has been improved, but now I'm thinking in 3.0. This is the whish list as it never ends !! I would like to integrate all sensor components in a unique circuit. Adafruit 390 is a versatile circuit with a lot of applications but in this case I would like to change it to have stabilized voltage output of 3.3Volts and also the XBee sockets. It could be also interesting to provide enough space to integrate other sensors. Reference documentation is available in github and it's a good starting point. Any help here ?? To complete the project is necessary to build a remote controlled faucet. In this way, the Arduino can order to water the garden if the water levels are so low. Design will be based on the remote sensor already in place. Also a further enhancement could be to allow to water from an internet application, why not ? But I will need to think about security in maslestorres.cat.